With over 400 recipe ideas and many wonderful stories from the cook’s garden, Tender: Volume I – A cook and his vegetable patch, is the definitive guide to cooking with vegetables from Britain’s finest food writer. ‘I would like to think I know more now than I did before I picked up my trowel and dug that first furrow of red and white radishes. How to get the best out of a vegetable yes, but also what are the different ways to treat it in the kitchen, which seasonings will make it sing, what other ingredients is it most comfortable or most exciting with. 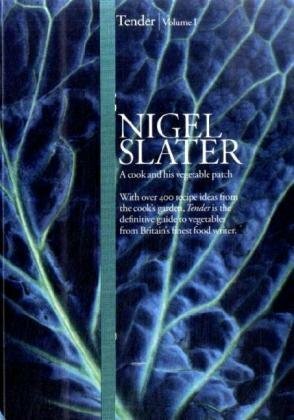 What are the classic recipes not to be missed by a newcomer and what new ways are there which might be of interest to an old hand.’__In his inimitable, unpretentious style Nigel Slater elevates vegetables to the starring role in his latest cook book, whether that means enjoying vegetables for their own sake or on the same plate as a piece of meat or fish. From crab cakes and crushed peas to broccoli and lamb stir-fry, luxury cauliflower cheese to a delicious broad bean salad, Tender has everything a cook could want from a recipe book.